In the early days of the Civil War, rumors of gold in the frozen Klondike brought hordes of newcomers to the Pacific Northwest. Anxious to compete, Russian prospectors commissioned inventor Leviticus Blue to create a great machine that could mine through Alaska’s ice. Thus was Dr. Blue’s Incredible Bone-Shaking Drill Engine born. But on its first test run the Boneshaker went terribly awry, destroying several blocks of downtown Seattle and unearthing a subterranean vein of blight gas that turned anyone who breathed it into the living dead. Now it is 16 years later, and a wall has been built to enclose the devastated and toxic city. Just beyond it lives Blue’s widow, Briar Wilkes. Life is hard with a ruined reputation and a teenaged boy to support, but she and Ezekiel are managing. Until Ezekiel undertakes a secret crusade to rewrite history. His quest will take him under the wall and into a city teeming with ravenous undead, air pirates, criminal overlords, and heavily armed refugees. And only Briar can bring him out alive. I thought I would LOVE this book -- I mean, zombies, steampunk (with Zeppelins), what's not to like? Well, I guess a strong narrative and plot would have helped. Also, I never really felt engaged to any of the characters and kept hoping they would stumble across some zombies to add a bit of zest. Overall, I recommend a pass on this book unless you just rally love Steampunk. 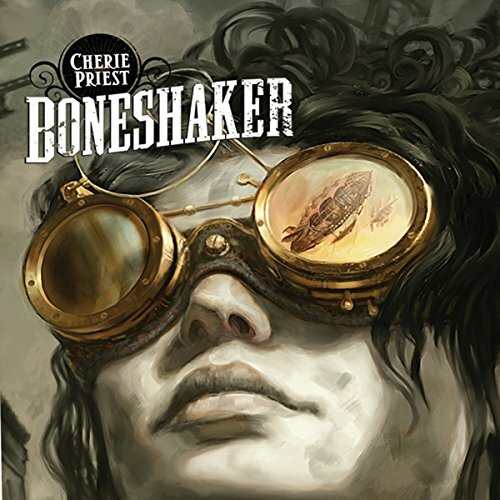 Cherie Priest's Boneshaker offers an interesting fusion of steampunk and zombies. Set in the Pacific Northwest during an alternate civil war historical era, gold rush fever creates a unique situation where a Russian inspired drilling machine, the Boneshaker, results in a poison gas no man's land where zombie like creatures roam. A teenage boy anxious to clear his father's name heads into the area with his mother in hot pursuit. The two of them experience unique adventures as they discover a nascent economy struggling to survive as the tale shifts back and forth between their perspectives. The tale is classic steampunk with a super-duper steam powered drilling machine creating all the mayhem that is still unsettled over a decade later. The poison gas released by the machine creates zombie-like crazed humans, while the gas itself can be distilled to a powerful drug that drives normal human involvement with the region. Air ships are evolved as expensive, but routine modes of transportation as well as implements of warfare. Along the way, there are other mechanical devices such as prosthetic limbs, gas masks, and sound incapacitating devices. Ultimately, this is a mother-son tale with a mother hiding a dark secret and her son searching for the truth. The choice of dual narrators was wise as the story alternates between the mother and son's viewpoints. Both narrators are quiet good with good character distinction. Pacing and tone are well aligned with the overall plot development. As a big fan of the Steampunk genre, I was excited to start listening to this story. I even held out longer than I would have on other books BECAUSE it was a steampunk story. Unfortunately, it wasn't worth it. The biggest problem was that our two heroes were completely unappealing. They are full of flaws and rough edges, but there is very little in them to make us like them or empathize with their plight. At times the teenager hero (Zeke) can be just a plain old annoying self-entitled teen. Another problem was the reading (at least on the part of Kate Reading). It was stiff and robotic sounding, and didn't do a good job of expressing the emotion our other main character (Ms. Wilkes) was going through after having her son run off to almost certain death. I went for this because of the steampunk aspect. I mean, how can a story with an airship in it be bad? Well, it's not bad, really, but I was disappointed by the story. There was too much emphasis on arguments between the mother and teenage son and less emphasis on developing the plot. I thought the Boneshaker machine was going to be at the midst of this story, but it was off to the side. Too bad. And frankly, I can do without zombies. For a steampunk zombie novel, it's surprisingly low on both steampunk AND zombies until almost the halfway mark. Some good ideas that are lost in the mess, but my biggest complaint as an audiobook is in the direction. Wil Wheaton, who is fantastic and Kate Reading, who falters when having to dispaly a range of voices, trade off the narration by chapters and inexcusably utilize radically different voices for the same characters, making this a far more confusing listen than you'd expect. Compared to transcendent YA novels like The Hunger Games, this one's a slog and unless you're gonzo for goggles, airships, and zombies enough to be very very patient until they show up, this one's a skip. Zombies, Zeppelins, and Zeke, Oh My! I really enjoyed the book and especially the narration by Kate Reading and Wil Wheaton. I’ve listened to other audio books where the female narrator just can’t do male voices convincingly (Emily Gray botched a Jasper Fforde novel so badly that I couldn’t get past the second chapter) but Kate Reading does a great job. And Wil is top-notch. Unlike some reviewers, I didn’t mind the narration switching back and forth between these two voices. In fact, it seemed to give the characters more dimension somehow. As for the book itself – what a delicious concept. Zombies, zeppelins, sky pirates, a mad scientist, a Wild-West society underground in the ruins of “Old Seattle”, and a resourceful mother’s desperate search for her son. The book was a bit slow in places, and some dialogue dragged on much longer than it had to (hence my 4-star, not 5-star rating), but that’s okay. The slow beginning led to a dynamite ending, and a perfect set-up for future novels. This novel isn’t what I would really call “steampunk.” I think it’s only called that because the publishing world has to put everything in a slot. It’s more like “Wild West Zombie punk,” if such a category can be imagined. But the female characters are strong and fully imagined, the desperation of the characters feels real, and the ideas are wonderful. And the outrageous names – Leviticus Blue, Doctor Minnericht, Jeremiah Swakhammer – LOL! I rarely (because I'm cheap and OCD) abandon a book. It may take me awhile, but eventually the constant chirp in the back of my brain makes me run and pick the damn thing up (come on...you paid real money for it) and just finish it. However, there are few RARE exceptions to this rule. When a book is SO poorly written, so filled with cliches, 'bad' adjectives, and weak verbs; when the dialogue is so awkward and stilted that it is a painful experience to read; when the book produces no virtuous feelings in me; when there is NO forward momentum (except for the earthy desire to finish and be done with it) -- it begins to dawn on me (pg 194) that I should just abandon the book. Thus I excommunicate it. I close the book, blow out the candle, and ring the damn bell. May god have mercy on Cherie Priest's soul. This book read clunky and slow, much like the gadgetry within it. I wanted to like it, due to a strong female lead character, but this book was simply a cut-and-paste of trendy subjects-- ooh steampunk! zombies! Seattle! These themes don't work in isolation and unfortunately, this book doesn't work at all. There was too much dialogue, not a strong plotline and very little imagination. Good cure for insomnia, though. Boneshaker is an interesting study in a good idea that just falls flat. Simply put the world is amazing, the idea is enchanting, and the supporting cast of characters are each a ray of imagination. But, and its a very large but, the main characters, mother and son protagonists, are flat, one dimensional, lacking any interesting dynamic qualities, and down right annoying. I cant even relate in any meaningful way to them, and time and again I just struggle to care. The son is a cliche of the annoying brat. And annoying he is. Maybe its the narration, maybe its the writing, but I cant remember a character that has got on my nerves so much. The mother is slightly more dynamic, and only mostly a cliche of the abandon and abused single mother. She almost makes up for the other half of the book. 2 out of 5 stars for almost. If there was one word I could use for Boneshaker, its almost. Cherie Priest's BONESHAKER is a romp through an alternate Civil War era Seattle, torn apart by Leviticus Blue's Boneshaking Drill -- a Russian-funded experimental drilling engine designed to tunnel under the Alaskan ice, looking for gold. But something goes wrong when Blue tests the machine, and gas which would become known as "the Blight" begins to seep out of the ground, killing those who breathe it. And worse. So a large section of the city is walled off, Blue has disappeared, and his widow, Briar Wilkes, is left to raise the son she didn't know she carried when the calamity struck. She and her son, Ezekiel, are treated with disdain and open contempt by the remaining townsfolk, believing she must have known what Blue was up to, and so blaming her in part for the new way of life on the "Outskirts" around Seattle. Ezekiel, longing to clear the family name, heads into the city for answers, and Briar soon follows. Only then do they start to truly understand what has become of those who have been claimed by the Blight -- the "rotters" -- zombies whose appearance in the book is truly suspenseful and riveting. Add goggles and gasmasks (to protect against the Blight) and gadgets dreamed up to sustain human settlements within the ruins of the city, Civil War era airships, and a great cast of supporting characters, and it's no wonder that BONESHAKER has had the praise heaped upon it that it has. It's great fun and well-imagined. Here, Kate Reading gives a great deadpan Briar Wilkes, capturing the frustration and urgency of a tired, bitter mother looking for her son, and putting a great voice behind Jeremiah Swakhammer, the big, armor-plated -- well, I don't want to give too much away. And Wil Wheaton helps bring Zeke and the characters he meets to life, particularly taking the day with his performances as Zeke, a certain Princess (this one is great! ), and the mysterious "Dr. Minnericht." How this one escaped nominations for the Audies I don't know.